I’ve not been able to get out with my cameras and so have been going through photos taken this past winter, specifically my Great Blue Heron images. This Great Blue Heron was photographed back in February at Blackwater NWR. The cloudy day created soft reflections on the still water. As I started to turn away to leave, the heron took flight. I quickly tried to re-zoom and focus, capturing the following blurry image. It’s not what I planned! But I thought it turned out pretty cool after all. I was sorry I spooked him; but am happy to report when I ‘re-looped’ the wildlife drive, he was back in his spot as I slowly cruised by. It’s a location where you can easily find a Great Blue Heron fishing at the refuge. In the past 1½ weeks, Bella & Beau had to deal with some rain and a lot of windy days, many days exceeding 20+ mph, even a couple days of gale force winds. The wind played havoc with Beau’s continued hard work to build a strong nest. But he has never given up, no matter the weather. Beau heading up to the nest. Beau with more nesting material. Bella landing with a nice stick! Even Bella has been helping, specifically materials for the nesting cup they have created. Bella bringing nesting cup materials. Bella bringing in more nesting cup materials. Bella bringing her prize to the nest. Bella heading to the nest. With all those sticks arriving, they have to be placed just right, according to Beau. Sometimes Bella disagrees, and a tug-of-war occurs. 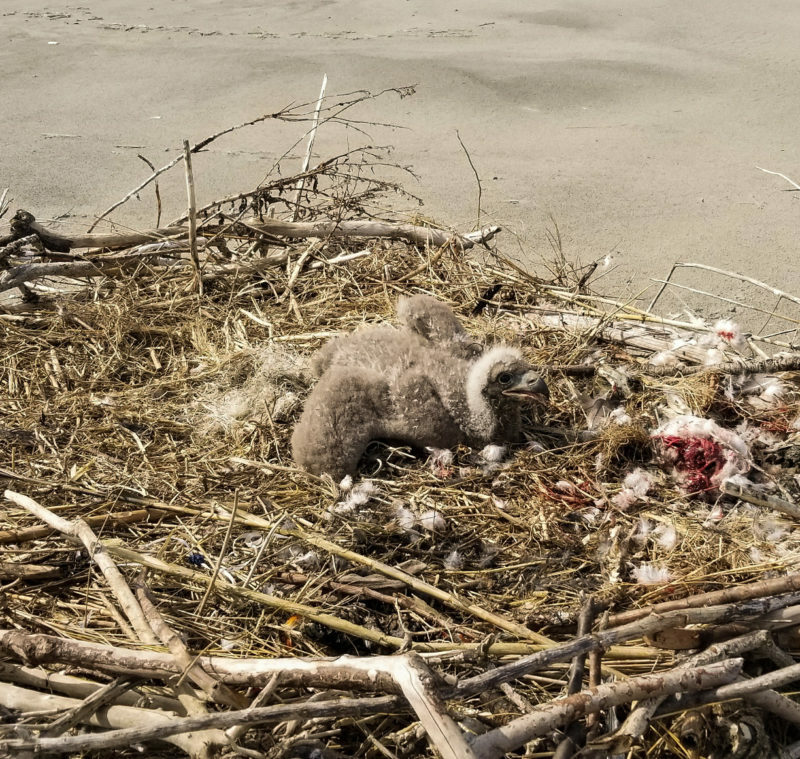 One rule about an Osprey nest, it is to be kept clean of poop. The chicks are taught early to back up, lift their tail, and aim up & over the nest rim to the outside world. Bella gives an example. Mating has been non-stop. Beau’s instinct is strong to procreate! When they finish, most times Beau takes off the nest, fetches a stick, and returns back to place it for Bella. It is important that the male show his commitment to the female so she knows he can provide a nest as well as feed her and a new family. So Beau has also been quite busy fishing and bringing back meals to Bella. Beau will usually eat the head first before taking it to Bella so he can get some nourishment as well. Bella can be very aggressive when Beau arrives, usually snatching it away from him, then taking off with the fish to a telephone pole across the creek from the nest. Beau delivering headless fish for Bella. Beau stays still while Bella moves to get the fish. Bella grabs the fish from Beau’s talons. and takes off with it in her mouth. Bella heading to her telephone perch to each her meal. First, a quick change of the fish from the mouth to the powerful, sharp talons. Bella doesn’t want to drop it! Beau arriving with a fish for Bella. Bella moves quickly to grab it. Bella started taking the fish. Bella positions the fish in her talons. Bella takes off with her fish to the telephone pole. Bella eats almost all her fish here. Beau snuggles down in the nesting cup while keeping an eye on Bella. Bella doesn’t bother to look. Bella is still ignoring Beau. There’s still the occasional harassment from other area Osprey. No longer any real challenges, just the airspace territory they all think they own around them. The Osprey seem to all have their own nests now and are busy with their lives. 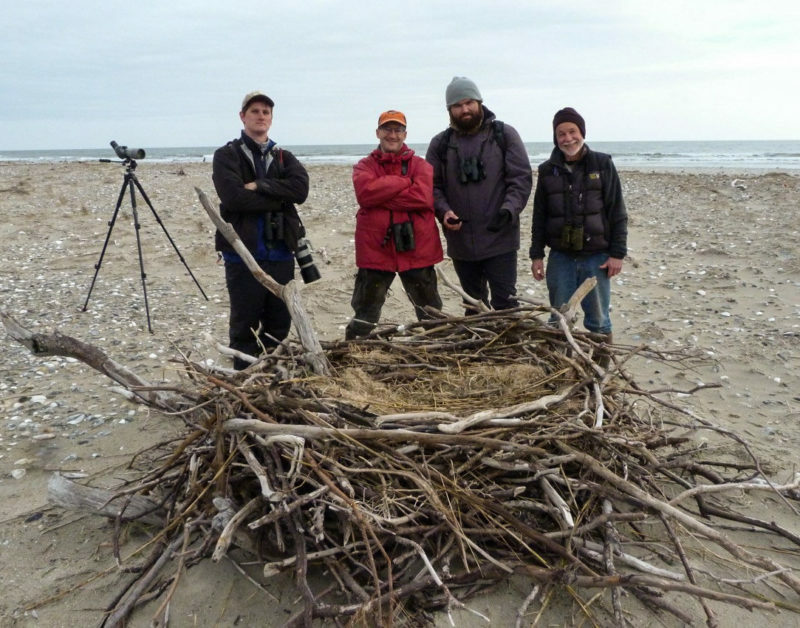 Thank goodness, they all really challenged Bella & Beau to take their nest platform from them. We said it before, waterfront real estate is prime! There is also the occasional Bald Eagle that ‘passes through’ overhead, much to the frustation of Bella & Beau. I was watching and taking some photos of them, when they both started screaming, took off the nest and flew towards me. Why are they flying at me so angry? I snapped some shots but was also looking away from my camera towards them, making sure I wasn’t possibly getting attacked. I saw then they weren’t looking at me but something up over my head. What was the frenzy about? Suddenly, a Bald Eagle passed out in front of me, with Beau in pursuit. The Eagle kept on going, trying to out-fly Beau. Proud Beau finally gave up the chase as the Eagle headed off. Last year, Bella laid her first of three eggs on April 17th. I’ve been on watch, looking for signs for this year’s first. During the last few days, more mating occurred, and the nest was constantly being attended to. In addition, I noticed both Bella & Beau did a lot of napping. A busy last few days! It is exhausting being an Osprey! Beau even began laying in the nest cup as if he was incubating, while Bella stayed perched alongside the nest rim or if she left with a fish. This worried me at first, I wondered had Bella laid an egg but didn’t care to incubate it, yet Beau was trying? When Beau left the nest, Bella would not change her perch. I researched this odd behavior and found that the male will possibly start mimicking incubating as another sign to the female he can be the Dad he needs to be when she needs a break. I had never seen this before! Well, today, I believe was finally the day! Early this afternoon, Bella changed her normal perch stance, and got into the nesting cup. I checked on her often with my binoculars; and she remained there, shifting, panting, napping, moving soft nesting materials around her. Beau would arrive and perch, look at Bella often, and then leave. 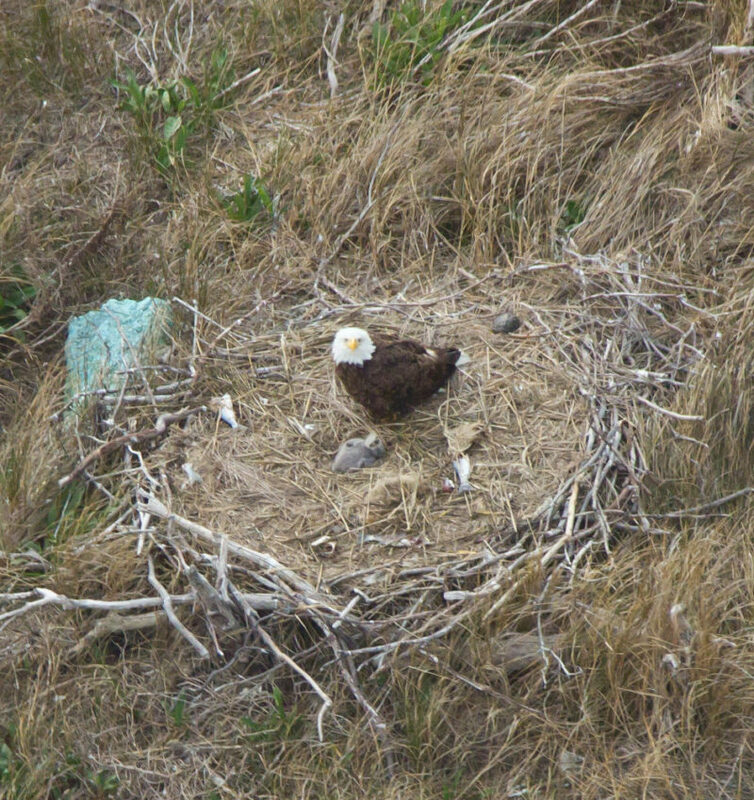 I only saw Bella get up once, taking a quick flight due to a pedestrian walking below the nest platform with a dog. She quickly returned and I watched her shimmy and shift, as if she was incubating. My last shot this evening at a cloudy sunset. If Bella did in fact lay an egg, up to 2-3 more eggs can follow, each laying 1-3 days after the previous. Time will tell this coming week! With that exciting news, I’ll end with a bunch of beauty shots of the hopefully soon-to-be parents, Bella & Beau. Note: The majority of my photos for the Bella & Beau series are shot from my balcony about 200+ feet where I’ve got just enough advantage height equal to the top of the platform. My equipment: a Nikon D200 and D750, with a Nikon AF-S VR-Nikkor 70-200mm F2.8 lens combined with a Nikon Teleconverter (1.7x magnification), zooming all the way in. At photo processing, it is then necessary to crop at least 50% to share close-ups with you. The Bella & Beau series is not so much about high-quality photos (although I seriously strive to get the best, detailed shots for the storyline!) as it is about the antics and adventures of an Osprey pair’s daily life. 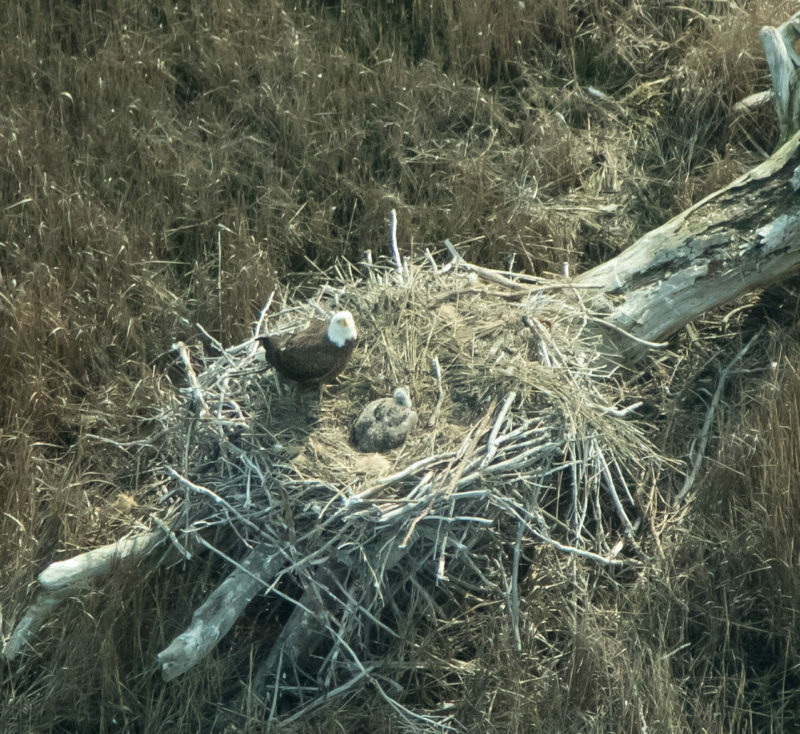 It is also my hope you will learn a little bit about the amazing Osprey and enjoy following along! Since I am on a recent posting ‘kick’ with Bald Eagles, I’ll finish it off with some recent perched shots of several at rest. An Eagle is beautiful and majestic, no matter the scene! Three Bald Eagles in flight on three different types of days. 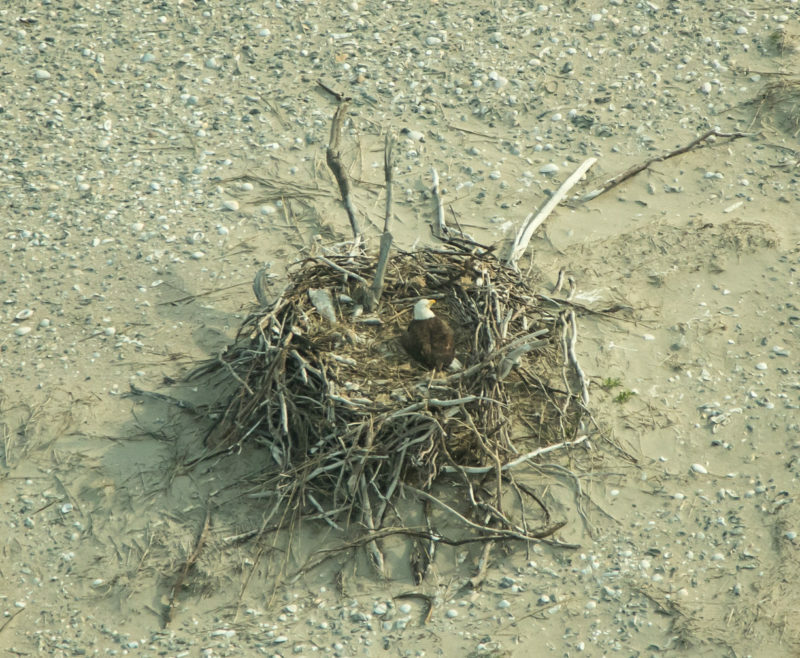 No matter the weather or how often, always an exciting moment to see an Eagle! All recently photographed at Blackwater National Wildlife Refuge.